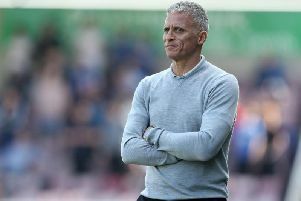 Cobblers boss Keith Curle has been delighted with the way his side have responded to their heavy defeat to Colchester United last week following four points from two difficult away trips. A 4-0 home loss to United had left the Cobblers dangerously close to the League Two relegation zone and even had some fans questioning Curle’s position as manager. But Town have reacted in the best possible way, beating Tranmere Rovers last Tuesday and then taking a point off leaders Lincoln on Saturday, albeit having played over half the game with an extra man. Bruno Andrade and Aaron Pierre both scored before half-time as Northampton maintained their healthy 10-point cushion back to the relegation zone. “A few people would have been slightly surprised and even dismayed when I said that sometimes the best thing that can happen to you is to get a kick up the backside,” said Curle after Saturday’s 1-1 draw at Sincil Bank. “We had scoreline suggests that you’ve been absolutely hammered and it’s easy to say ‘we need a reaction, chaps’ but the secret it making sure there’s enough character, enough belief and enough desire in the changing room to have a positive reaction. A few people would have been slightly surprised and even dismayed when I said that sometimes the best thing that can happen to you is to get a kick up the backside. “All week has been about the challenge that we’ll face here and being brave and prepared enough to go up against the league leaders and upset them. Cobblers return home this weekend when Crawley Town are the visitors to the PTS, and Curle wants his players to maintain their recent high standards. “The information we give the players won’t change and the format won’t change,” he added. “We try and peak for the game on a Saturday and I think the energy levels have been absolutely fantastic in the group since the 4-0 reverse against Colchcester.